Opened in 1959, Daytona International Speedway Florida is an iconic landmark situated on Floridas western Atlantic coast, less than a 90 minute drive from Kissimmee, Orlando. Parking and entrance is free, however if you would like to experience the size and gradients of the Daytona International Speedway track, then you have the option of a tour, however fees apply. The only way in which to realise the enormanty of this amazing venue is by visiting it. The recently extended stands provide seating for 101,5000 spectators, the tracks of which there are four, range from the quarter mile karting and motorbike flat track to the two and half mile high speed tri oval complete with thirty one degree banks. General parking and entry is free, as in entry onto some of the stands which overlook the track and pit area. This colourful area provides an opportunity to sit back a realise the actual size of this magnificent stadium, a true American icon. In addition, there are a number of specific visitor tours available at additional cost. These provide a greater insight into the history and layout of Daytona International Speedway, and include a ride around the famous circuit. 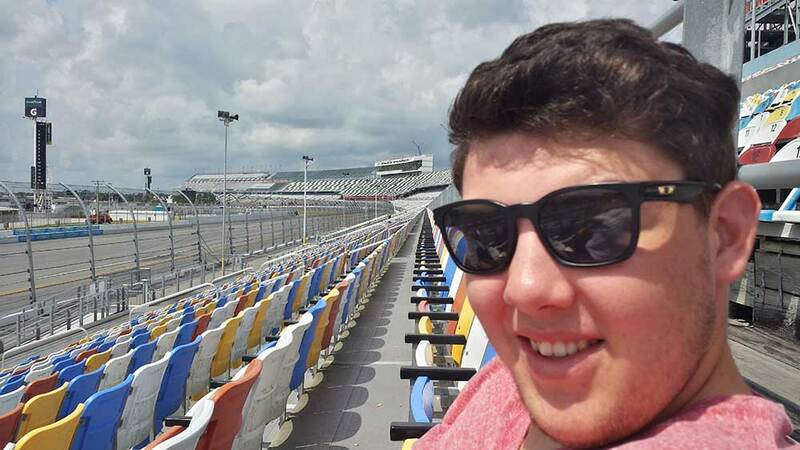 All in all if you or anyone in your party have a passion or even a simple interest in motor racing, then a visit to Daytona International Speedway is a must, and when you’re done with all thing motor racing you can relax on any one of fabulous beaches located in and around Daytona.